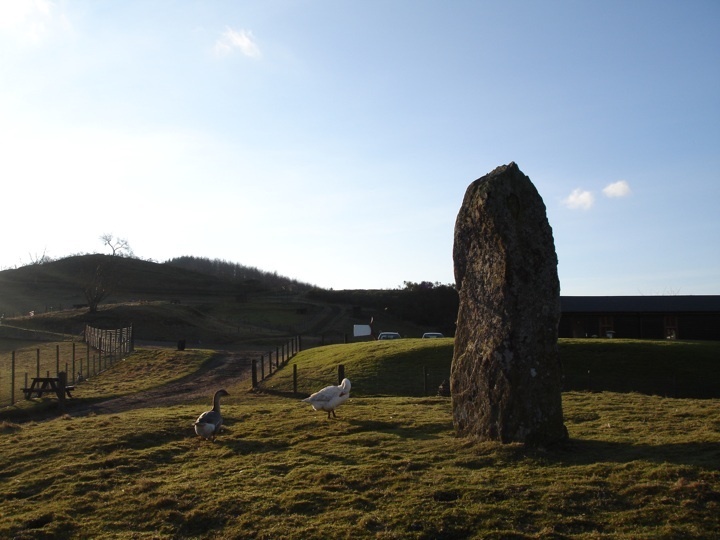 This huge standing stone measures an impressive 2.61m (8′ 7″) tall, rising from the centre of an obvious round mound which is almost certainly artificial, or at least an artificially-enhanced natural knoll. Some large stones, which may actually be bedrock, can be seen poking through the grass at the side. Standing next to the shop and café of the Auchingarrich wildlife centre, this site commands good views over the surrounding area, and stands at a height of 450 feet above sea level. Auchingarrich is in the parish of Muthill and the county of Perthshire. Published on the 14th of May 2010 at 4:19 pm. Updated on the 20th of February 2014 at 2:51 pm.